While we have been criticizing public officials for their criminalization of baggy pants, it appears that we can now add the objection that they are assisting crime by requiring tailored outfits. 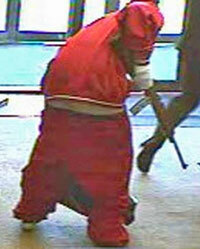 Columbus police have a video showing a man who failed in a bank robbery effort when he tripped over his baggy pants. This was not, however, the first felon foiled by baggy pants, here. 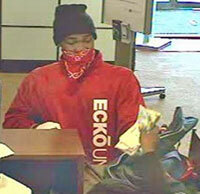 Now how is this bank robber going to pass a credit check with pants like that: http://lawblog.legalmatch.com/2010/11/08/states-are-finally-getting-the-right-idea-by-limiting-credit-checks-on-job-applicants/ If he wants a job, he’d better start getting his pants tailored or something. I understand the thief’s fashion motivation, you shouldn’t go to work without dressing appropriately, in this case the baggie look of a convict. Some fashion statements cost more than others, but they are all valuable. Since reading this one I’ve had “Baggy Trousers” by 80’s English Ska band, Madness. I’ll leave it for someone else to embed, but it’s a great video. Madness were well known for knocking out great videos for a few grand when other bands were spending hundreds of thousands on stuff that wasn’t anywhere near as entertaining. It’s too bad that so little light verse gets published these days. I love the clever light verse written by people like Ogden Nash, Dorothy Parker, and others. Through an interminable series of Q and A. Tempted Adam with forbidden fruit. When he got conked on the head with a falling apple. Strictly amateur stuff. I used to read Burma-Shave signs. Correction: Love the alliteration in the last LINE. Well done! That’s quite a quatrain. Love the alliteration in the last lne. to actually read a poem! I have always wondered about the baggy pants guys that I see on the street. I just don’t understand what the attraction is to pants that hang below your behind! I’ll leave this on a couple threads … I have an organization in Haiti recommended by DeWine and it looks like a very good one.